Range: India, Sri Lanka, Southern China, Burma, Thailand, Laos, Vietnam, Malaysia, Borneo, Philippines, Indonesian Islands. Habitat: Tropical areas, mangrove forests, thick vegetation, in or around bodies of water. Status: Threatened in some areas. Diet in the wild: Crabs, mollusks, fish, snakes, turtles, birds, frogs, lizards, rodents, eggs, monkeys, small deer, and carrion. Diet in the zoo: mice. Water monitors come from the family Varanide whose members include the largest and heaviest of the lizards. In this group the water monitors are second in size only to the Komodo Monitors. 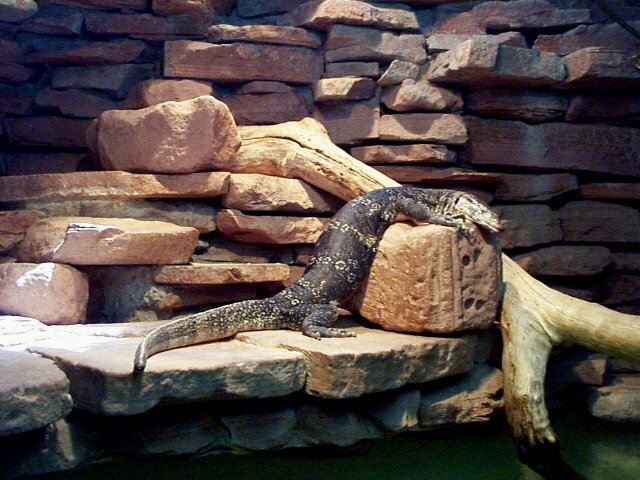 Water monitors can grow up to lengths of eight feet but they are typically about half this size. They are covered with scales that are round and protruding, and on their abdomen they have smooth scales that resemble squares. Their coloration is usually drab gray or olive with yellow spots arranged in circles which are arranged into a few stripes across their backs. The yellow is also scattered throughout the body. The tail is extremely long composing half of the total body length. Water monitors are widespread over a large geographical area. In some areas such as India and the Philippine Islands they are becoming scarce through unsustainable use. Other areas, however, such as the Andamen and Nicobar islands, Sri Lanka, Southern China, Malaysia, and Borneo have large populations of water monitors. Water monitors, as their name suggests, are rarely found far from water and they have no trouble swimming long distances. This ability has allowed them to colonize many remote islands. Once on these islands they have no trouble adapting as they, being carnivorous, will eat almost anything. Their diet depends mainly on their size. Smaller monitors will eat fish, crabs, mollusks, insects, eggs, frogs, snakes, birds, and even other lizards. Larger monitors will eat these same things along with monkeys, small deer, carrion, and even human corpses. In some areas they fill the ecological niche commonly held by predatory carnivores. With abundant food sources, water monitors will breed year round with the female typically laying 15 eggs. They can make their nests in burrows, tree hollows, and even inside termite mounds. Water monitors are equipped with powerful limbs and sharp claws which are good for digging. They have long necks which are good for lunging out at prey. They have a greatly enhanced sense of smell which they get through a special organ called the vomernasal or Jacobson's organ. This organ is also found in snakes, and like a snake the water monitor will move its tongue in and out smelling the surroundings. When the monitor is alarmed as a defense it will puff up its body, hiss loudly, and lash about its tail. 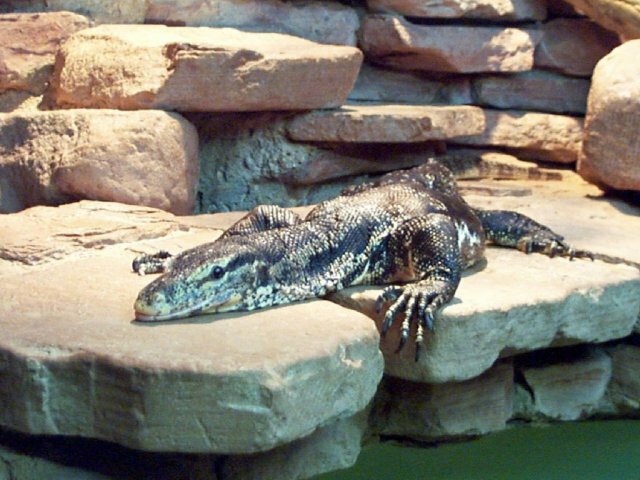 Presently at the zoo there is one female monitor, which was born in captivity at the herpetarium. (actual birth date is unknown, but she has been at the zoo since 1984) Her name is Ruby and she is about 4 ft. long. Zoo records show that in 1992 she successfully laid a clutch of eggs. Within the constraints of their habitat, Ruby became very aggressive against her mate while protecting her eggs. The water monitor at the zoo has temporarily been taken off display, while some adjustments are made to her habitat. I was able to observe other monitors however, and from what I saw they don't move around too much, and when they do they are just trying to find a more comfortable spot to lie in. They constantly are sensing the surroundings using their tongues, and are always on the lookout for food. Interview conducted with F.W. Zoo herpetologist Rick Reed, conducted Nov. 21,2000. Illustrations by Dr. David Kirshner. Published by facts on File 1989.